WorldClassRoom FAQs - What is a conversation? The Conversations tool is the private messaging tool within WorldClassRoom. It is similar to an email program or messaging functions on other modern websites which you may be used to. It is important to note that the WorldClassRoom Conversations tool is not your Webster University email account. You must still check or foward your Webster University email for other types of information which may not be directly connected to your course(s), but which is pertinent to your enrollment as a Webster University student or status as an instructor. You can also receive notifications about Conversations. The most useful type of notification may be by email, as this allows you to receive the full text of Conversation message and you can respond to them using your email client. How do I set my notifications? The WorldClassRoom Conversations tool allows you to communicate with a course, a group, an individual student, or a group of students. However, it is not tied to any particular course. Rather, your Conversations Inbox shows all of your interactions with other students and instructors in all of your current courses, and not just for one specific course at a time. The Inbox is accessible from the global navigation bar to the left side, no matter where you are in WorldClassRoom. Conversations also includes other types of private messages you might send or receive, such as comments or feedback on assignments. Note: These types of comments appear in both your Conversations Inbox and in the Assignments tool. Here is a sample of how comments connected to an assignment might look in your Conversations Inbox. 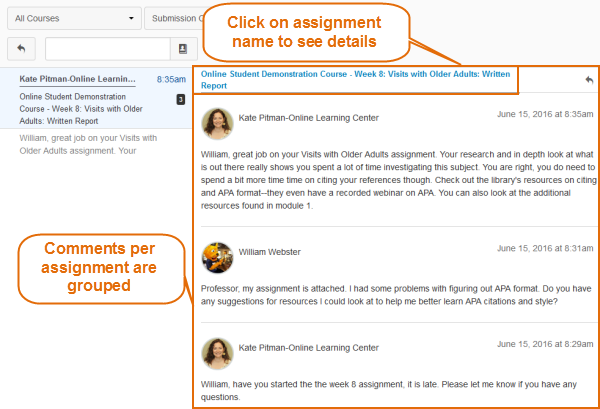 You can see that Conversation messages connected to an assignment are grouped together with the name of the assignment at the top left--to see Submission Comments--you need to select "Submission Comments", in the drop dwon next to "All Courses". 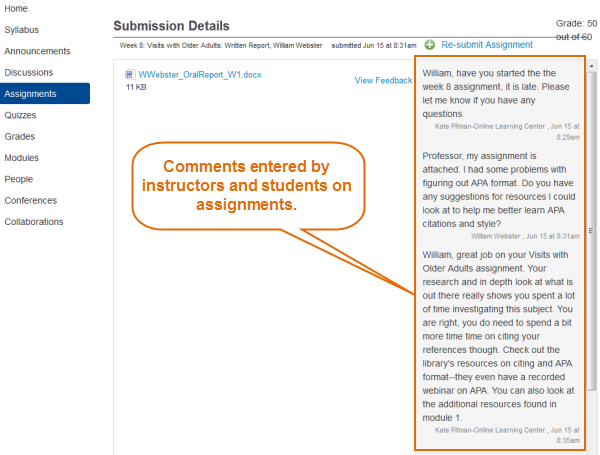 You will only see the comments--not the grade, but you can click on the subject to take you to the assignment. Now, here is a sample of those same comments as they appear within the Assignments tool.